Prevent surge, limit recycle losses and maintain process stability. Compressors operating with very high compression ratios, rapidly changing pressures and flowrates and varying molecular weights require specialized compressor control techniques to prevent surge, limit recycle losses and maintain process stability. Petrotech’s compressor control solutions provide the user with a wide range of flexible and economical compressor control and protection capabilities. 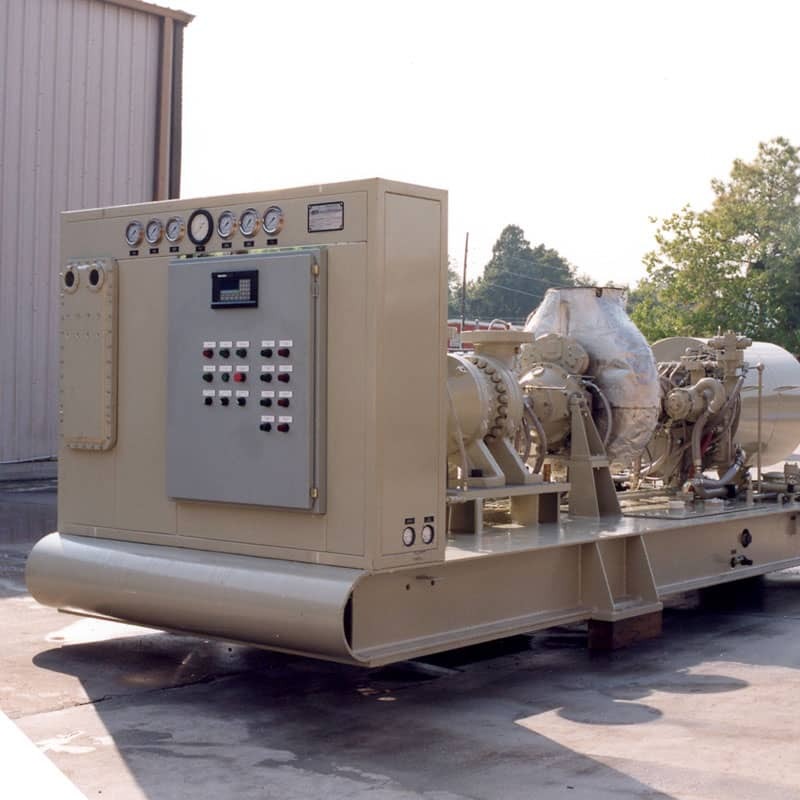 Our multiple algorithms allow us to easily install the most cost effective and technically appropriate ASC solution for a wide variety of compressor process applications and configurations, including side stream flows and variable molecular weight applications. The Calibration Algorithm determines where the compressor is operating relative to the surge limit line. Petrotech’s anti-surge control system provides multiple algorithms to best accommodate the compressor’s operating process requirements, the available instrumentation. The Petrotech anti-surge control system includes provisions for variable inlet guide vanes, variable molecular weights, suction or discharge flow measurement and high or low compression ratios. Petrotech’s adaptive surge detection algorithm re-calibrates the position of the surge control line in response to surge events. The Control Algorithm adjusts the final control elements to prevent the operating point from crossing the surge limit line. The Petrotech ASC system control algorithms provide selectable AUTO/MANUAL/SAFE-MANUAL recycle valve control and PURGE/RUNUP/RUNDOWN sequencing coordination. Other features include decoupling responses to speed and process controllers and optional transmitter failure contingency strategies. Final control elements such as recycle or blow-off valves serve as levers on the process or compressor. The final compressor control elements receive output signals from the control algorithm to move the compressor operating point away from the surge limit. A common final control element is a recycle valve with associated control accessories. Petrotech’s model RVAM recycle valve assembly is an example of a final compressor control element specifically intended for use as an anti-surge control, final control element. Flexibility of controller platforms means a lower cost of ownership by integrating compressor solutions into the user’s preferred controller. No separate proprietary controller is required. For those instances where integrating the controller into a system is not practical or cost effective, Petrotech also provides the same field-proven solutions in a series of stand-alone and add-on products.